Angels Aware! Christmas : Kathie Hill Music, LLC, Making music with and for kids for over 25 years! 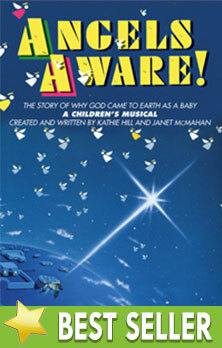 Home :: All Kid's Musicals A-Z :: Angels Aware! After nearly 25 years, still a favorite with children's choirs everywhere! Why did God come to earth at Christmas as a baby? Join Micheal, the arch angel, Sara, Cherry, and Harold as they explain to the heavenly host what will happen that first Christmas and why. You’ll love the biblical content, humor and diversity of music, including the classic Ten Commandments song "The Perfect Ten." Lively, creative, fun and tells the full story. Allows several options for number of children involved and the music is easy for children to learn and remember. In 1988, my church performed this musical, and I played the role of Isaiah. It was my first stage performance, and it's a musical I simply adore it to this day. The songs are catchy, yet meaningful. I used "The Perfect Ten" to teach 2nd graders the Ten Commandments. Would recommend this program for any church or Christian school. Kathie's Note: This musical has been in continuous print since 1984. People around the world present it then reprise it, share it with friends who present it, or give CDs to their adult children or grandchildren who were once in it. Would that every musical could be an Angels Aware! Jewel cased CD with left channel instrumentation and right channel (split) choral vocals (no dialogue or solos). Director's Book - Angels Aware! Downloadable book of all songs, script, production notes & piano transcriptions with permission to make 3 copies . Additional copies require purchase of additional 3x license/s. Listening CD Bulk Pack - Angels Aware! Singer's/Activity Book - Angels Aware! Downloadable original book with script, all songs in leadline only & activities with permission to make 3 copies . Additional copies require purchase of additional 3x license/s.